↑ "En direct, Emmanuel Macron élu président : " Je défendrai la France, ses intérêts vitaux, son image "". Le Monde. 7 May 2017. Retrieved 7 May 2017. ↑ Schnur, Dan. "Anger underlying French elections is roiling California too". San Francisco Chronicle. Retrieved 7 May 2017. ↑ "Dans un livre, Anne Fulda raconte Macron côté intime" (in ਫਰਾਂਸੀਸੀ). JDD à la Une. 21 April 2017. Retrieved 25 April 2017. ↑ "Emmanuel Macron", Gala France. ↑ "Emmanuel Macron, un ex-banquier touche-à-tout à Bercy" (in ਫਰਾਂਸੀਸੀ). France 24. 27 August 2014. Retrieved 24 April 2017. ↑ Chrisafis, Angelique (11 July 2016). "Will France's young economy minister – with a volunteer army – launch presidential bid?". The Guardian. ISSN 0261-3077. Retrieved 27 January 2017. ↑ "What Emmanuel Macron's home town says about him". The Economist. 4 May 2017. Retrieved 5 May 2017. ↑ Guélaud, Claire (16 May 2012). "Emmanuel Macron, un banquier d'affaires nommé secrétaire général adjoint de l'Elysée". Le Monde (in ਫਰਾਂਸੀਸੀ). ↑ Wüpper, Gesche (27 August 2014). "Junger Wirtschaftsminister darf Frankreich verführen". Die Welt (in ਜਰਮਨ). Retrieved 29 April 2017. ↑ Kaplan, Renee (2 September 2014). "Who is the hot new French Economy Minister". Frenchly. Retrieved 14 April 2017. ↑ Marnham, Patrick (4 February 2017). "Who's behind the mysterious rise of Emmanuel Macron?". The Spectator. Retrieved 1 February 2017. 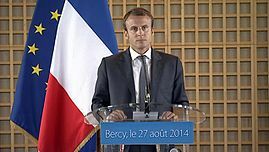 ↑ "Emmanuel Macron s'explique sur ses anciens revenus de banquier". Le Point (in ਫਰਾਂਸੀਸੀ). 19 February 2017. Retrieved 1 February 2017. ↑ "Macron, militant PS depuis 2006, n'est plus à jour de cotisation depuis 5 ans". L'Obs (in ਫਰਾਂਸੀਸੀ). Retrieved 10 December 2016. ↑ Corbet, Sylvie; Ganley, Elaine (26 August 2014). "French gov't reshuffle expels dissident ministers". Associated Press. ↑ Revault d'Allonnes, David (17 February 2015). "Loi Macron : comment le 49-3 a été dégainé comme un dernier recours". Le Monde (in ਫਰਾਂਸੀਸੀ). Retrieved 16 April 2017. ↑ "Emmanuel Macron n'est plus encarté au Parti socialiste". Le Figaro (in ਫਰਾਂਸੀਸੀ). 28 August 2015.